Greetings. Cal here with another episode of Tuesday Stretch. 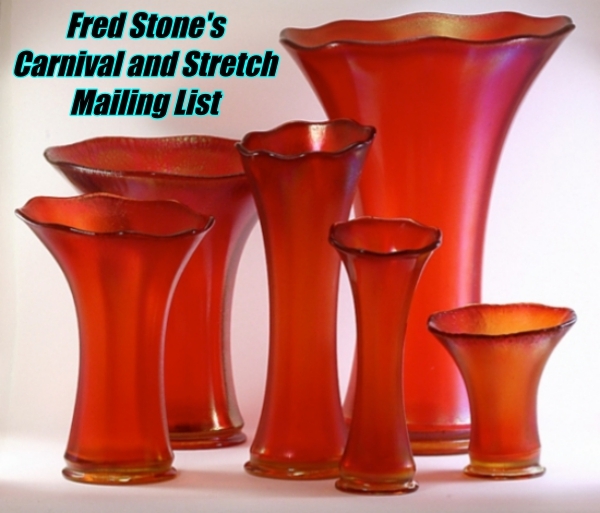 I hope everyone is learning something new about stretch glass, seeing some new (to him/her) stretch glass and gaining an expanded appreciation for stretch glass as a result of our Tuesday chats. Tonight I am going to venture a little bit out of my comfort zone and into the world of stretch glass with a pattern. 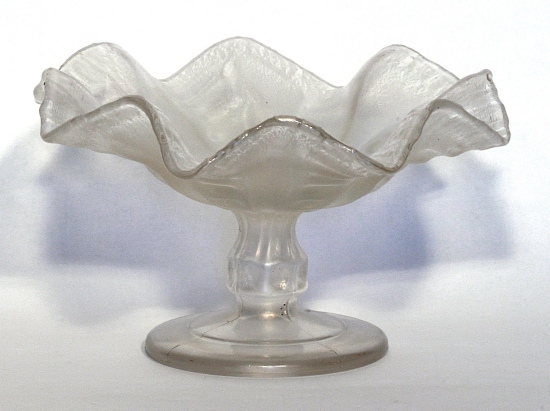 Some of you may remember the post by Mitchell a week or so ago concerning a Dugan Coin Spot comport in a white stretchy finish. 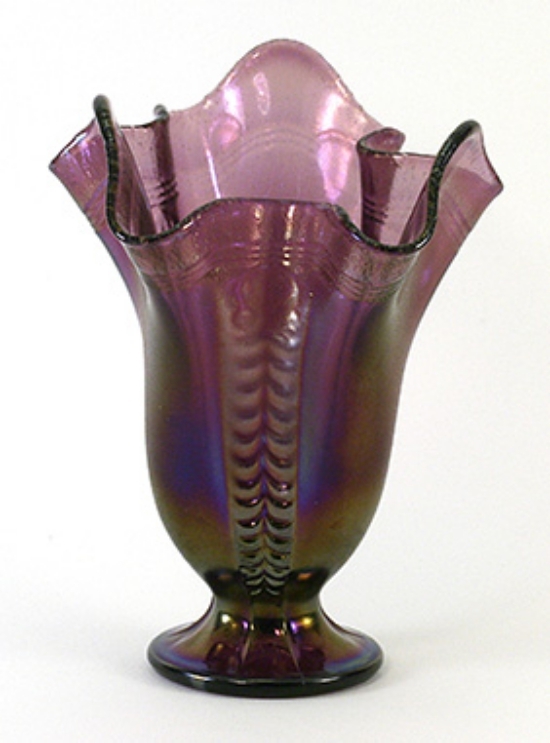 According to the posting, this was the first of these, in this color, known to Mitchell and maybe to others in the world of iridescent glass. 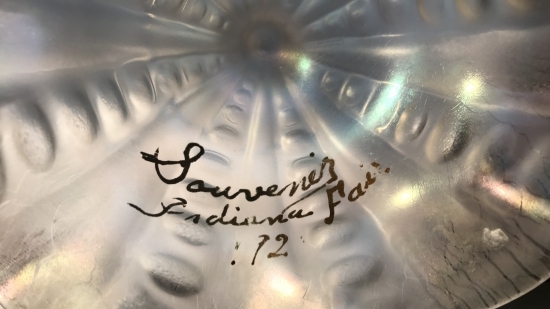 To make the comport even more interesting, it had the words “Souvenir of Indiana Fair” and part of a date painted onto it in gold. It turns out that this was not the first of these known in this color, but I don’t believe there are very many of them around. Maybe after this article we will find out that there are more of them than we currently believe exist, so if you have one and you would like to share it with us, that would be great. We know of at least 1 other one, so now there are two. The other one does not, to my knowledge, include the souvenir painting. I have long been a fan of Dugan-Diamond stretch glass. Their unusual shapes caught my attention early in my stretch glass collecting and I’ve managed to acquire quite a few examples of it, including several of the Coin Spot comports in varying iridescent finishes. Some of these comports have a nice stretch finish and others have a shiny finish. 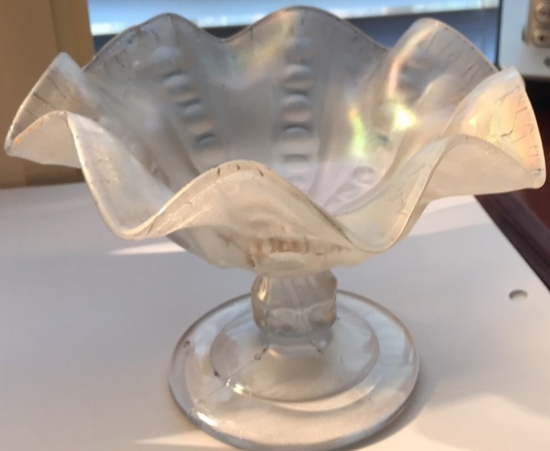 We may never know if this was intentional on the part of Diamond-Dugan, but what we do know today is that a variety of these comport exists, when it comes to iridescence and all are quite attractive. We will take a look at some of these in a variety of colors in a minute. From left to right we have Marigold, Peach Opal, Blue, a somewhat different color Blue, Green, Purple, Cobalt Blue and White. 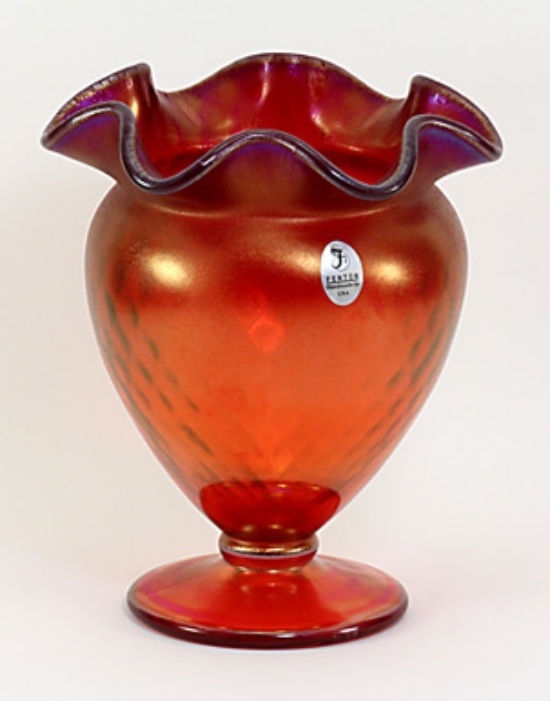 What we don’t see here is one in Egyptian Lustre (Black) or Ruby (Red) or Topaz, colors which are well-known to have been made by Dugan-Diamond during the stretch glass period. Does anyone have one of these in one of these colors? If so, we would sure like to see it. 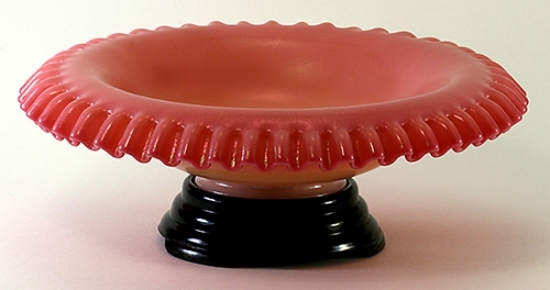 One more item tonight that may be of interest to those of you who are interested in learning more about stretch glass: on February 8th The Stretch Glass Society will host a Stretch Out Discussion on several colors of late period Fenton stretch glass. There is no charge for joining the discussion; all you need is a phone and about 60 minutes beginning at 8pm Eastern Time. This discussion is live via a conference call. 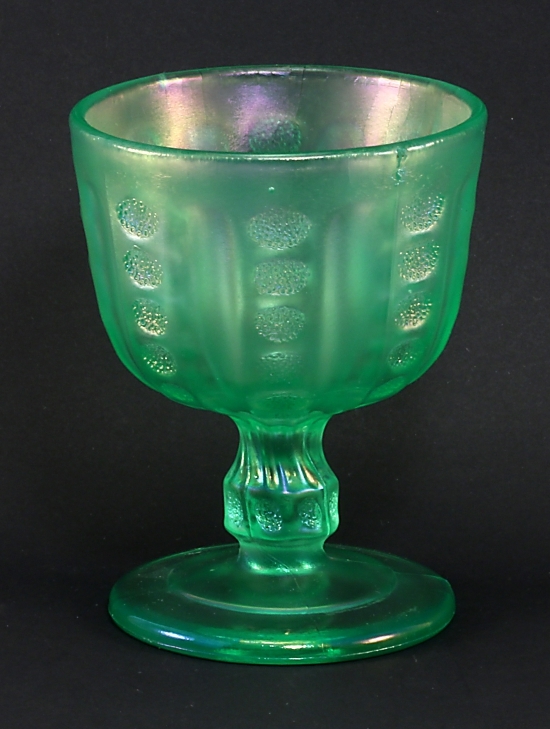 Photos of the stretch glass are posted on www.stretchglasssociety.org. To join the call at 8pm Eastern Time, please call 415 464-6800 and enter conference ID 04211974#. Please consider this your personal invitation from me and everyone at The Stretch Glass Society.